I’m sure you’ve heard at least one famous band say they miss the old days, when they could play in smaller venues. The Hafenkneipe, which recently celebrated its ten year anniversary, is exactly the kind of club they’re talking about! 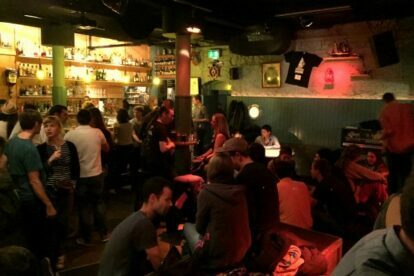 Reopened in 2006 with a new concept, focusing on live music (before the place was a techno club) it’s become very popular for its intense and intimate concerts. At least once a week (mostly Mondays) there is a show, mostly Indie-Rock, Grunge, Folk, Singer-Songwriter-Stuff and anything to do with Punk. The venue has space for 100 people, so it’s not only very tight, good acts sell out pretty quickly. So make sure to check out the program on their website soon enough. Because, if you like sweaty, unforgettable concerts this venue is definitely for you. When there’s no live music, the Hafenkneipe is a regular bar and still very worth visiting. In the “Dockland pub”, as the English translation would be, you’ll find corner sofas, porthole-lamps and bright blue walls that make you long for the sea.